Here at DH HQ we understand what trying to juggle work, the home, small children and everything else that goes on in life looks like and it isn't always pretty! Firstly, how on earth are we supposed to remember it all when our sticky notes are removed and rearranged by little hands because "they weren't pretty where they were" and secondly when did our tots and tweens develop better social lives than we have? What is very clear is that if us parents want to stay on top of it all we need to get organised. Many choose Sunday night to plan for the following week however Friday night works better for us at Dotty Hippo HQ as it gives us a chance to organise / pick up anything needed over the weekend before Monday. Whatever day you choose stick to it and make it a weekly habit. This time is for updating calendars and charts, making sure everything is in place for the following week, making to do lists or shopping lists for items that need picking up and of course reminding yourself of upcoming appointments and events. 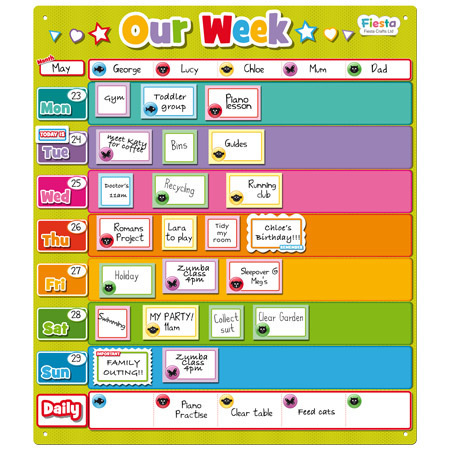 A chart like this fabulous Fiesta Crafts one is perfect for keeping evevryone on track and seeing who is doing what, where and when! If you've spent any time on Pinterest the chances are you've seen fabulous pictures of command centres. 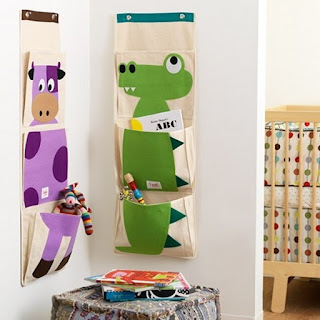 A command station is a set place where items for school or nursery lives, where papers, seasonal items and more all reside so that you may grab them when you need them. It means that even if you are in a rush you'll know where new name stickers, the sun cream or gloves, the permission slips for a school trip and everything else is. 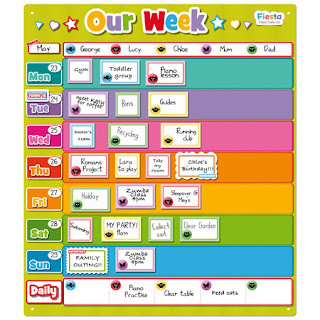 Pull it all together by using a weekly chart or similar where you can record the activities for the next week as well as anything you need to remember. It is so much easier to have a visual reminder of things and of course if they are right there for everyone to see there's a fighting chance someone will remember even if you forget to do / supply something! A command centre needn't be boring when you have fabulous fun wall organisers such as these from 3 Sprouts to choose from! The best way to stay on top of your week is not to have too much going on. Of course all families are busy, especially when little ones get old enough for play dates, activities out of the home and such like however it is important to have time in your week to just relax and be together as a family. What are your best tips for organising your week? Do comment and let us know. There's no such thing as too much organisation when you have a busy household with small children in it!